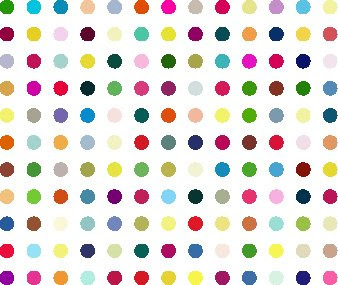 How much information is there in one of Damien Hirst's spot painting? I was prompted to think again about Damien Hirst by the news of his plan to auction some of his artwork directly, bypassing the dealers. Consider one of his spot paintings: Lysergic Acid Diethylamide (LSD). There's been a lot said about these paintings, but I want to think about their information content. 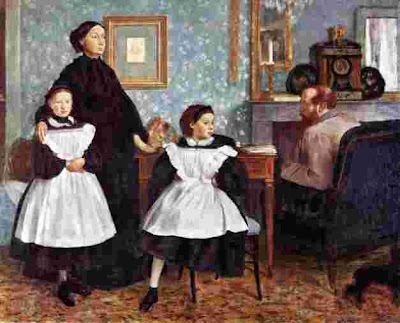 It is easy to generate an image of this painting, or something similar, on the computer. I've been playing with this. 1) Drawing an image in Adobe Illustrator. I had a go at this, aiming to match (approximately) the relative dimensions (ratio between spot diameters and spot spacing) and getting a rough match of the colours. I saved it as a jpeg file using the settings for maximum quality, which gave a file size of 110 kbytes. I've pasted it below. 3) Finally, I wrote a similar macro but combined it with a data file that contained the RGB parameters for the colours of each circle. The macro text file in this case was 636 bytes, while the data file with the colour information was 1676 bytes. Combining the macro and its data in a zip file, gave a total compressed file size of 1344 bytes. So, what does all this say? There is a sense in which I've got an image of Hirst's LSD painting down to 1344 bytes (on the grounds that the choice of colours must have been significant). This is 'algorithmic information', and it's not many bytes - a lot fewer than required for 1919 for example. Of course, I am aware that this little image on the computer is a long way from the real meter-square painting. I'm imagining using this, from the computer, as a recipe for doing a real painting. So you could add to the VBA macro the instruction "Copy this enlarged to 106.5 cm x 127 cm using gloss paint on canvas" (or whatever was used), then you have an algorithm for getting something like the original. I don't know enough about the technique to know how close this would get you to the original. I suspect those who know might deride my suggestion that it gets you anywhere near, but it would surely get you some way towards it. Actually, I'm not quite sure where this argument is going. I'd had in mind that I would be able to say something along the lines of Hirst's painting containing so much less information, and that therefore the value of Hirst's is almost entirely in the context, whereas Degas's contained lots of information within the painting. I'm not sure that is coming out quite so clearly.